Google has scanned over 20 million books into Google Books and intends to scan every book in the world by 2020. 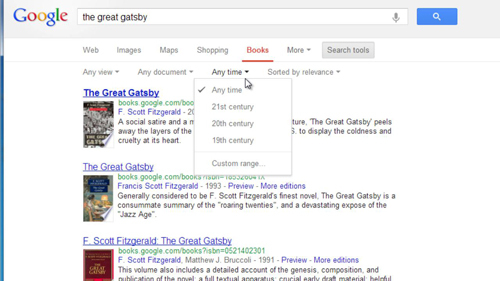 This tutorial will teach you how to search within Google Books. You can see that we are at the Google home page, “www.google.com.” To get to the Google Books search interface, click on the “More” button in the header section of the webpage, next to “Calendar.” This will bring up a drop-down menu with more options. Click on the “Books” option which will bring you to the Google Books interface. 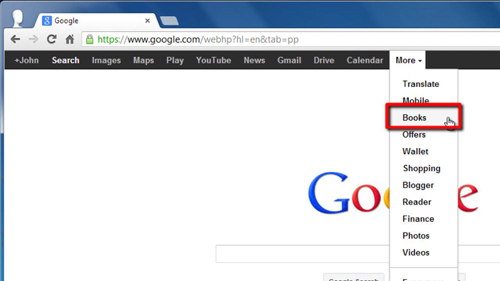 From here, type your keywords into the search box and click the search icon. Google Books will display your results on the page that follows. To narrow your results using a number of parameters, click on “Search Tools,” just underneath the search box, and choose your limiters, such as time period and type of document. Well done, you now know how to search within Google Books.